Sometimes you need to improve the typical Valentine's Day routine, treating your significant other to something a little more divine than red roses and dinner at the usual favorite restaurant. 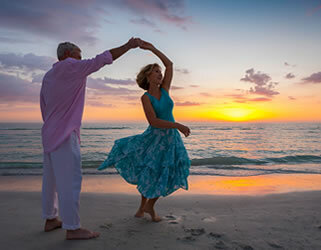 So why not treat you and your loved one to one of the most romantic getaways in Florida by indulging at the TradeWinds Island Grand Resort in St. Pete Beach? They're guaranteed to provide you with a luxurious and love-filled getaway you and your better half will remember. Their package is a phenomenal deal being offered at both the TradeWinds Island Grand Resort and the Guy Harvey Outpost. You and your love are sure to find a room to fit your needs, and expect to be pampered and catered to during your entire stay at the resort. Prices and room availability here using the code ROMANCEW18 to secure the package deal. So what is included in this romantic getaway? Two-night stay anytime between January 1st and February 28th 2018, so you can plan a Valentine's getaway to fit both of your schedules. To fully enjoy what the resort has to offer, a $100 gift certificate to the Palm Court Italian Grill, which features Mediterranean delicacies and the finest wines. To take your night to the next level, you can call ahead to book a dinner under the stars on their patio, or even a place in one of their intimate dining rooms at 727-363-2358. Your mornings will be filled with mimosas and warm muffins delivered to your room, all upon your request. At night kick back in the room with a bottle of champagne on the house and four succulent strawberries dipped in fine chocolate. Two champagne flutes are yours to take home, as a token of your romantic stay. The resort's amenity fee will be waived, but you can enjoy a beach cabana, wifi, a parking pass, and so much more. Whether you're a local looking to have a little getaway or one from out of state looking to explore all that St. Pete Beach has to offer, this is a great way to reconnect with the one you love! So dig your toes in the sand and enjoy all the pampering they will provide. Go ahead and indulge, because you both deserve it!